Project obstacles and solutions: Covance is a drug development corporation. Their Greenfield, Indiana facility was expanding and was in need of concrete floors for drug producing machinery. The sensitivity and regulation of their products require that the concrete slabs under the machinery be produced with very little water to eliminate any kind of breakdown of the adhesives used to bond the finished floor to the concrete. Traditionally, low-moisture concrete has been very hard to finish because of its low water-to-cement ratios. This causes it to set up very fast. It is hard to work with and typically has to be shot full of admixtures to stabilize the hydration process and extend the slump. U.S. Concrete has developed Aridus concrete, a low-moisture concrete that sets up in normal time ratios. Aridus mix designs are highly regulated, with aggregates and moisture content strictly limited. 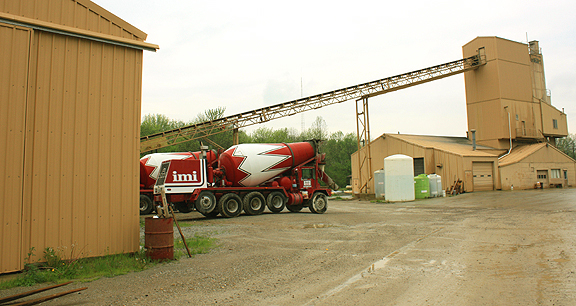 IMI is licensed to supply Aridus concrete in Indiana. QC/QA personnel at several IMI concrete plants sent their raw materials to U.S. Concrete labs in San Jose, California for an approved mix design. These mixes are engineered on a plant-by-pant basis. The course and fine aggregates at the IMI Martinsville plant was approved for an Aridus mix. However, the IMI Greenfield plant’s testing was not completed before the Covance job was ready. The two plants are 54 miles apart – way far to deliver concrete to the job site. IMI loaded and transported the Martinsville aggregates to the Greenfield plant. They used concrete mixer trucks to move the aggregates instead of tri-axle dump trucks to keep the stone and sand from the open air. This controlled moisture content. The stone and sand were then stored in selected bins and moisture content was carefully monitored. The next challenge came on the day of the first slab pour. Concrete delivered to the site had to be bucketed and transported up to another floor via a fork lift. The finisher was finding that the concrete was losing its plasticity near the end of the finishing process. IMI QC/QA adjusted admixtures to accommodate this and subsequent batches were workable from the point the bucket arrived until the finisher completed his work. The Covance mechanical concrete pads were completed on schedule. The Aridus concrete met the unique challenges of the drug manufacturer’s regulations. IMI was able to deliver Aridus concrete that not only met the specifications of U.S. Concrete, but also was easy to finish. For more information on Aridus concrete, click here.